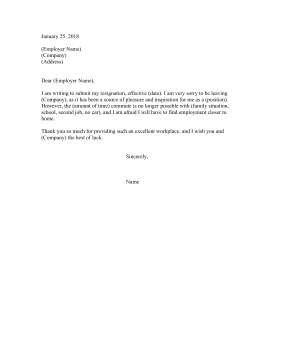 Great for employees who are no longer able to make a long commute, this resignation letter lays out the difficulties of driving too far to work. I am writing to submit my resignation, effective (date). I am very sorry to be leaving (Company), as it has been a source of pleasure and inspiration for me as a (position). However, the (amount of time) commute is no longer possible with (family situation, school, second job, no car), and I am afraid I will have to find employment closer to home. Thank you so much for providing such an excellent workplace, and I wish you and (Company) the best of luck.